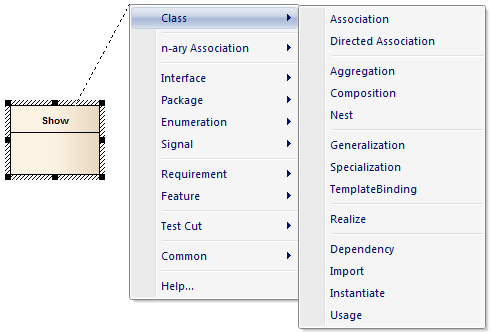 If you want to create new elements and connectors quickly on a diagram, you can use the Quick Linker on an initial element to guide you in creating related elements and connectors of the appropriate types, without having to weigh up the full range of options from the Diagram Toolbox. The Quick Linker consists of paired menus that list the commonest objects appropriate to the context of the selected element. You simply choose the type of element you need from the first menu, and that displays the second menu offering a choice of appropriate types of connector between the original and new elements. When you select the connector, you create a new element connected to your initial element, complete with any subordinate objects such as Object Nodes and Action Pins. If you drag the Quick Linker arrow onto an existing element on the diagram, only the connector menu displays, so that you select the type of connector to create between the two existing elements. There are two methods of accessing the Quick Linker menus. Click on this arrow and drag it in the direction in which you want to create the new connector and element. When you release the mouse button, the element menu displays. When you select an element type, the connector menu displays. When you select the connector type, the element and connector are added to the diagram in the location in which you displayed the menus. After selecting the element, press Ctrl+Shift and the keyboard arrow key for the direction in which you want to create the new connector and element (Right, Left, Up or Down). The element and connector menus display as above. When you select the type of connector, the new element and connector are created off the edge of the element appropriate to the arrow key you pressed. For example, if you press the Right arrow key, the new element is created to the right of the original element.